Spot Prices were mixed with wind output in Germany predicted to go down today and Hydro production and nuclear availability improving in France. Front-Month prices in France were higher than Germany for the first time since August 2012. There was minimal change on the gas curve yesterday with Day-Ahead closing at 64.40 and Front-Month only changing by 0.05ppt. The system remains oversupplied and the warmer weather forecast is ensuring the bears do not take control. Demand is currently above the seasonal average but is expected to be down for the remainder of this week. 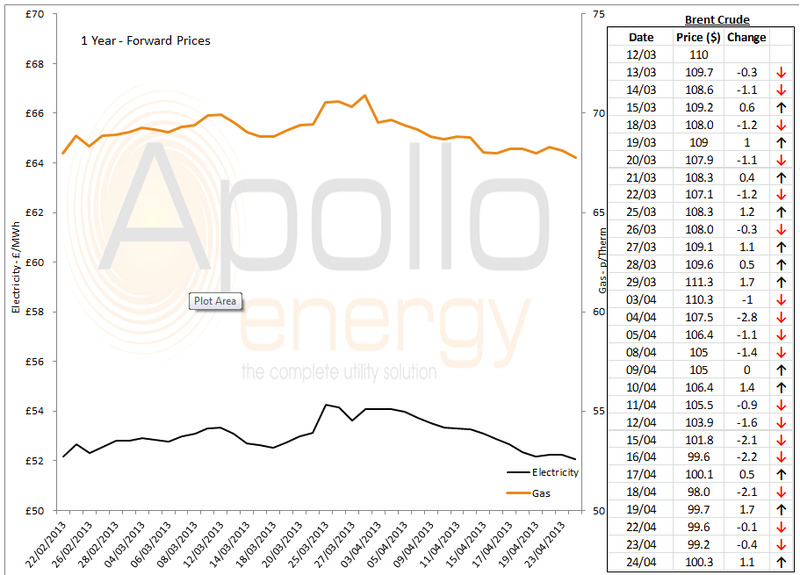 Both Day-Ahead and Front-Month saw a rise of £0.55/MWh closing at £46.8/MWh and £48.95/MWh, respectively. The Far-Curve saw most contracts make a loss, showing similarities to Brent which continues to fall. The only exceptions to this downward trend are Winter-13 which showed no movement and Summer-15 which made a gain of £0.3.MWh. Day-Ahead gas climbed 0.75ppt opening at 65.15ppt and May-13 had an increase of 0.20ppt, although most seasonal contracts saw no gains and Front season was unchanged. There was an increase in flows from the Langeled pipeline but the BBL interconnector dropped to a low 6mcm which led to Linepack opening short. Stock levels continue to rise and currently stand at 12% with only one storage facility currently in withdrawal mode. Day-Ahead power made a £0.70/MWh rise as a result of reduced wind generation while Front-Month dropped £0.10/MWh to open at £49.85/MWh. The curve had a varied outlook with most of the Far-Curve going up from yesterday's close, Summer-14 making the largest gain in price. Market close data has revealed that the 1-year forward price for both commercial gas & commercial electricity made a drop - closing at 67.77ppt and £52.08/MWh, respectively. This can be seen in the graph below. Note: Brent Crude prices are taken from opening market data, and do not represent the price as it changes throughout the day. Brent prices made a slight gain yesterday after hitting 99$/b, Gasoline prices however saw a drop and seems to be the weakest product in the oil complex. The financial market was unaffected by poor PMI data in China and Germany and mixed data from the US as the European Central Bank is set to lower its interest rates. The Buzzard oil field was generating at maximum capacity (210 kb/d) and cargoes have been brought forward from May to April as a result.